A native of Richfield, OH, and a 2000 graduate of Revere High School, Gunnery Sergeant Robert Gilbert enlisted in the Marine Corps in October of 2000. He began his career as a Heavy Equipment Operator and later became a Reconnaissance Man, serving with both 2nd and 3rd Force Recon Battalions. GySgt. 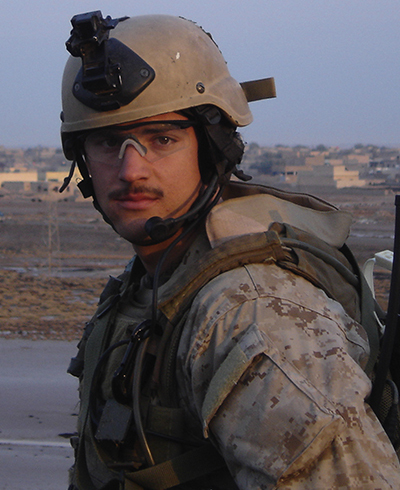 Gilbert joined MARSOC in May of 2008 and was an airborne parachutist and combat diver. He deployed in support of both Operations Iraqi Freedom and Enduring Freedom. GySgt. Gilbert, while involved in an intense firefight, exposing himself to enemy fire in order to direct actions of the Afghan soldiers he was fighting alongside, was injured in Afghanistan on March 8, 2010, suffering severe injuries to his head from a gunshot wound. He was transferred to Bethesda Naval Hospital and placed on life support. GySgt. Gilbert died eight days after the attack, on his 28th birthday, with his family at his side. GySgt. Gilbert’s personal decorations include a Bronze Star with combat V, Purple Heart, Navy-Marine Corps Commendation Medal with combat V, Army Commendation Medal, three Navy-Marine Corps Achievement Medals (one with V), two Combat Action Ribbons, and three Good Conduct Medals.